Janelle In Real Life: How I REALLY get ready for the day. How I REALLY get ready for the day. 25 weeks along in this pregnancy, and feeling pretty huge. Haha. I just wanted to share some of my getting ready tips for when you feel blah, and just want to kick it in your pj's. FYI there's nothing wrong with kicking it in your pj's on occasion, but sometimes you gotta get out of the house and you don't want to look like you just rolled out of bed! First of all... baseball caps are the bomb. You can throw your greasy, unwashed hair into a pony and put a hat on and no one will ever know! It's my favorite for a bad hair day. And since I can't wear hats everyday, dry shampoo is also amazing. I use Dove's dry shampoo and love it! Secondly, sometimes wearing pretty lipstick can help you feel a little more put together. The bright red color that I'm wearing in the photos above is one of my faves! It brightens up my face a little to have some color going on. And something you can't actually see in these photos is that I'm wearing concealer under my eyes. Pregnancy this time around has done a number on me and I have these huge dark circles under my eyes constantly. Soooo tired. But a brightening concealer helps so much to make me not look so much like a zombie! When it comes to clothes, I'm all about comfort these days. I'm a little lucky, in that I get to wear maternity jeans, which are the consolation prize for not fitting into regular clothes. 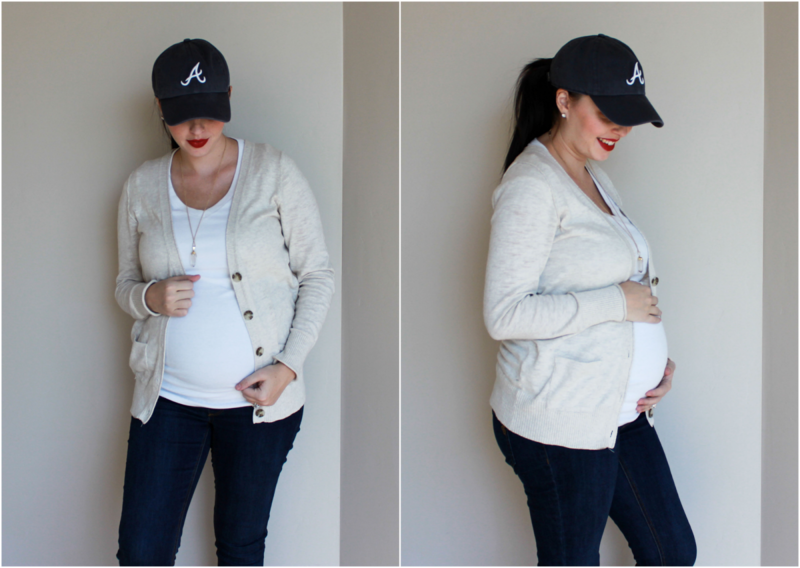 Maternity jeans are so comfortable and basically sweatpants. Buuut if you're not pregnant then leggings or a cute pair of joggers are a comfy pants option. A tee and a cardigan on top and you're ready to go! I wear a variation of this look most days and it's easy, comfy, and looks decent. What are some of your tips for easy getting ready routines? You look great! I use dry shampoo too. Love the red lip. love this outfit. Have a great weekend. I just bought a plain black hat for only $5 at Target today and I was thinking it will be perfect for those days I"ll have coming up as a new mom when I just don't have the energy to get myself all the way together. :) I'll have to remember the bright lipstick idea too!